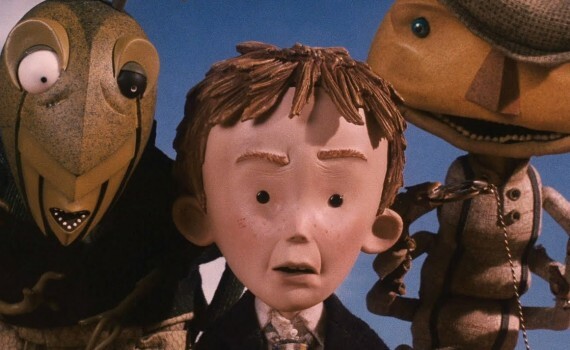 I recently read Roald Dahl’s James and the Giant Peach to my kids, and we then followed that up with watching the film version. It was shot 35 years after the book was written, giving technology some time to catch up with the visuals of the story. Ironically, the movie uses stop-motion animation for the majority and has a very classic feel, something that could have been produced years ago. But apparently Dahl declined numerous film deals, and this film wasn’t given a green light until after his death. His widow says he would have been delighted by the version, and we can only assume that she was delighted by the money she received for the rights. Call me cynical, but something there rubs me the wrong way, perhaps because I enjoyed the book much more than I did the movie. James Henry Trotter, a poor orphan boy who is forced to live with his evil aunts, all alone in the world and treated like a slave in his new home. Since his parents died in a freak rhinoceros accident, life’s been bleak, and James has no hope that anything will ever change. But magic can come in surprising form, and it comes to James as a strange man with a gift of even stranger green particles. They’re special, magic, life-changing, and when James accidentally drops them they begin to work on the garden instead of on the sad little boy. But don’t worry, James won’t be left out. As the peach tree in the garden begins to produce a fruit of enormous size, our hero finds a way to crawl inside the fruit, where he meets insects who have also been given a magical new existence. Once the peach breaks free, the group will go on the journey of a lifetime, traveling the world inside a giant fruit, chasing their dreams one adventure at a time. It’s a great story, a great book, but only a mediocre film. It starts live-action, is very sinister, James sings a sad song, and then things turn to stop-motion and the film really begins. It was directed & produced by Selick & Tim Burton, the duo that brought us The Nightmare Before Christmas, and definitely has that same dark, twisted vibe. And the music was done by Randy Newman, who did Toy Story the year before and would go on to do so many Disney films. So it’s not the team I didn’t love, it’s the adaptation. It’s just so very different from the book, with the Aunts featured more prominently, the sharks in the ocean completely different, eliminating the cloud men, adding an odd ending. I just felt like they went a different direction than I would have chosen. They story is still cool, of course, the voices are all great, and the songs are strong. I just wish I would have enjoyed it as much as the book and I didn’t, but it’s still a solid family film with cool artwork that deserves a rental.